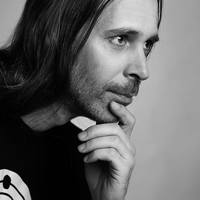 My artist name is KOSMA SOLARIUS, I am producing electronic music since 1989 and since 2001 I am into tuning my music to natural frequencies. I am using the tuning calculator of Icosmo Utilities, which you can purchase at their website under www.icosmo.de and I want to write some input for all artists and software developers to raise some awareness about the forgotten tool of tuning. Mostly the tuning is very profane and it is hard to tune a track properly, if you use different synthesizers and specially vst plugins. Many of those plugins don't even offer the option of proper tuning and some of the really big and expensive vst synths are still somehow behind. Sometimes they offer to change the Master Tuning from 440 Hz into something else, but mostly they don't have exact Hz to input and just full Hz steps are possible. Off course often there is a so called fine tuning, but it is also not standardized, for example in cent or Hz and often I have no idea what this tuning scales are based on. 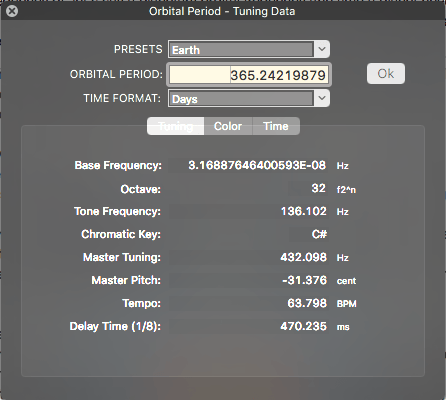 if I tune to a natural frequency of, let's say a planetary orbital frequency (the time a planet needs around the sun), I can simply calculate this with the Icosmo calculator and it gives me tuning data as seen at the attached screenshot of the calculator (I used the Earth Year as example.). You can see, the Master Tuning is exactly 432.098 Hz (this frequency is often mentioned this days at different articles, but mostly nobody really gets it right and knows it's real origin. The software also gives me a exact pitch at -31.376 cent and you can just dream about, that any software synth ever lets you tune that exactly. Even a exact octave analogue tempo at 63.798 BPM is offered and I have never seen any DAW which offers me the option to setup a tempo that exactly. Interesting to me is, that tuning is somehow the soul of music. If a band doesn't properly tune together, it would sound terrible and after the Germans came up with the standard master tuning (wich is great to have) at 440 Hz, all producers and musicians seem to have forgotten about tuning. So many artists a looking for their "sound". They buy lots of effects and toys, just to make a guitar sound individual and what ever they do, but nobody is touching the tuning, where the sound actually is getting it's color. 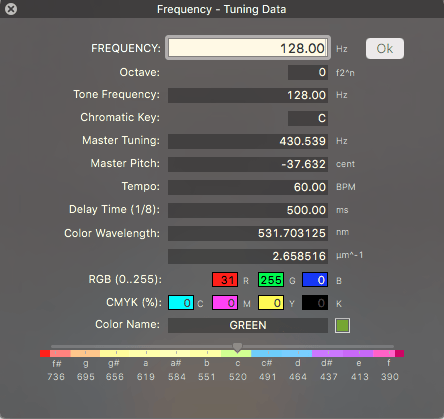 The tuning calculator of Icosmo also converts any given frequency into it's tuning data (next screenshot) and there was never a simpler and faster way of knowing what actual key a frequency is and what are the exact corresponding tuning data. Specially in the spiritual world, they keep throwing around with all those fancy sounding frequencies, but 99% of their authors have no idea what they are talking about. I would love to shake the walls of the music world a little and wake you all up to remember the soul of music. Tuning is the soul of music and it is about time to implement the tuning abilities in a more accurate way at all your nice developments. I purchased the Synplant, because I can tune it, but still I would wish to have the ability to tune in even more exactly. Delay times can actually be automatically calculated based on a wavelength of any sound, so it would be a dream, if the delay time would be set automatically (at least optional) to the chosen frequency. This makes all much sense, because you know of the importance of being in tune and if you think that further - all should be in tune and this will open a world of new options. I am not just a producer and musicians, I am actually developing ideas about this all and I would love to find professional partners to develop the music tools for the next century. All existing synths are mostly just repeating what was there already and the modulation options are always the same. The possibilities of modulating sound by the use of new input sources would blow your minds!!! Probably I should write a book about it, so people at least start thinking again about the SOUL OF MUSIC.